These cookies were most likely inspired by all the photos of Swedish Fish Oreos people keep sending me. Blech! I’ll take just about any Oreo cookie flavor, but they can keep that one one. 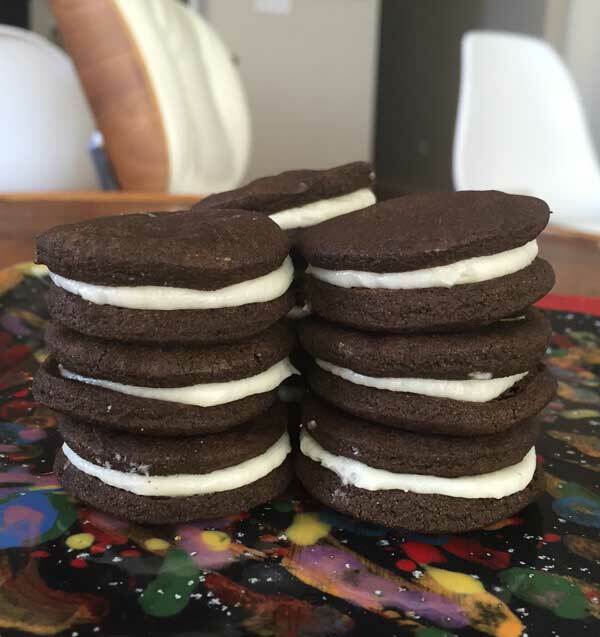 But icky red filling aside, all the Oreo photos had me craving chocolate sandwich cookies, and these little guys were the result. Aren’t they cute? 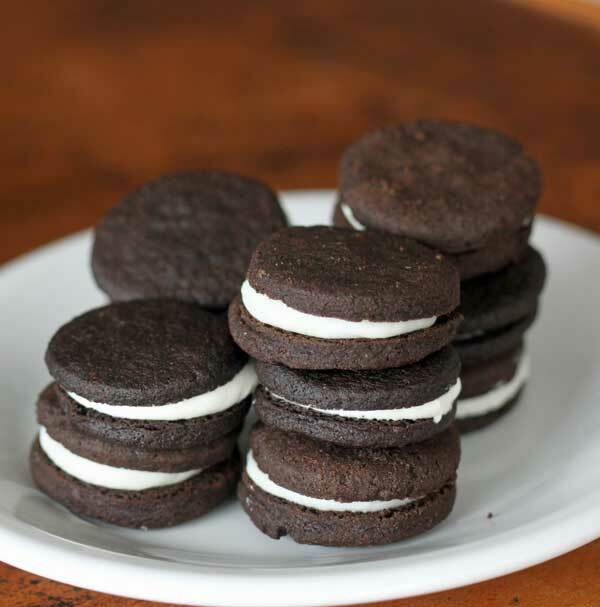 This recipe for chocolate sandwich cookie is adapted from Wayne Brockman and made famous by Smitten Kitchen. But as usual, I added my own twists. Got rid of the shortening. True, shortening helps the icing hold up better at room temperature, but I have a refrigerator and wasn’t planning on taking these cookies anywhere. And finally, my awesome set of graduated round cookie cutters lets me make cookies in just about any size, so I went with 1 1/2 inch circles. They seemed pretty small at first, but when baked and filled, were the perfect size sandwich cookie. So using the small circle cutter I got quite a few cookies. You will get fewer if you use a standard 2 inch cutter. Chocolate Sandwich Cookies made with Hershey's Special Dark cocoa powder. Preheat oven to 325 degrees F. Line a large baking sheet with parchment paper or nonstick foil. Combine the flour, cocoa, espresso powder (if using), baking soda, baking powder and salt and set aside. In a mixing bowl, beat the butter until creamy. Add the sugar and beat until creamy, then beat in the egg and vanilla. Add the flour mixture and stir to make a thick dough. Using a level teaspoon, scoop up dough and shape into small balls. Set the balls on the lined baking sheet and press down to about 1/8 of an inch with bottom of a glass or the palm of your hand. For perfect circles, after pressing down the dough punch through with a 1 ½ inch cutter and remove the scraps. Bake circles for about 10 minutes or until cookies appear set. Let cool on the baking sheet for about 3 minutes, then transfer to a wire rack. The cookies will firm up a bit as they cool. Prepare filling. Beat together butter and confectioners’ sugar until well blended, then add vanilla and milk (or half and half) and beat until creamy, adjusting liquid as needed. Put in a heavy duty freezer bag or a piping bag and snip off the bottom corner. Squeeze a dab of icing in the center of half the cookies and cap with remaining cookies. Total cookies should be around 40 depending on the size of your cookie cutter and how thin you cut the dough. To halve the recipe, weigh out half of each ingredient on a scale and use 22-25 grams of beaten egg. I hope you enjoy the Chocolate Sandwich Cookies! Thanks Vanessa! I had a lot of fun making them. Let me know if you try this recipe or a different one. These look adorable! I’ve always wanted to try making something like this. Thanks for the recipe! I always learn something new from you, including what a Swedish fish oreo is LOL! These are so cute, and all of your improvements make them sound even more delicious! Oreos are a favorite of mine and so are Swedish Fish but the idea of them together….Some mash-ups should not happen. 😉 On the other hand, these cookies are something I definitely need to make 🙂 They look so good! The cookies look delicious. I might be too lazy to make them which I’m a little embarrassed to admit. I’ve not seen the Swedish Fish Oreos. They don’t sound very appealing.